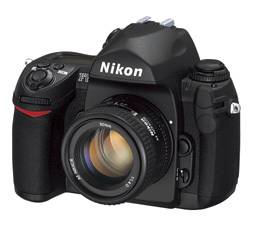 The latest camera in the F series, the F6 began with the Nikon F in 1959. In 1971, the Nikon F2 was introduced, followed by the F3 in 1980, the F4 in 1988, and the critically acclaimed F5 in 1996. Each camera featured the outstanding qualities of its predecessor along with the latest in Nikon's technological advances, such as the legendary Nikon F mount, while offering the latest innovations to meet the increasingly diversified needs of professional photographers. The new Nikon F6 meets the uncompromising standards of reliability that professionals demand. An aluminum-alloy die-cast chassis; magnesium-alloy front body and covers (top, bottom); aluminum-alloy back body and camera back; strategically placed rubber surfaces, and an easy-to-grip texture. The self-diagnostic shutter assures accurate release up to and beyond 150,000 cycles, even in the most extreme environmental conditions. The Nikon F6 embodies the strength, rigidity and durability to perform whenever and wherever professional photographers need it. Multi-CAM 2000 Autofocus (AF) Sensor Module: The advanced high-speed, high-precision 11-area AF system with 9 cross-type AF sensors ensures quick response and sharp focus regardless of shooting conditions. Shutter speeds up to 1/8000 sec. Customizable Function Button can be used to perform FV Lock, AE-L/AF-L, Flash Cancel or Metering operation. Four film advance modes: Single (S), Continuous Low-Speed (CL) for up to approx. 3 frames per second (fps), Continuous High-Speed (CH) for up to 5.5 fps (or 8 fps with optional Multi Power Battery Pack MB-40), and Continuous Silent (Cs) for nearly silent operation at approximately 1 fps.